The Yoga Vie yoga training is for students who wish to DEEPEN THEIR PERSONAL PRACTICE; as well as, students who wish to LEARN TO TEACH YOGA. Keep reading to learn which program is best for you! As a Yoga Vie graduate, you will head into the world confident and ready to lead grounded, safe, and inspired yoga classes. Learn how to offer modifications, posture options, clarification of contraindications, and how to create a complete series of classes with progressive levels of difficulty. Gain a deeper personal relationship and understanding of yoga philosophy. We will help you master the basics, while giving you space and encouragement to find your own teaching style. This course will mark a major event along your journey to finding more depth in your practice and in life. Upon graduation, you will be ready to sequence and teach your first all levels class and begin sharing yoga with others! Not interested in teaching yoga? This course is designed to help you lead a healthier and more spiritual life in accordance with your true nature. This training experience provides a great way to find long lasting happiness, peace, and the ability to share the yogic lifestyle with others. Learn to manage your stress, develop your own home practice, and meet a community of people, just like you, who want the same. Apply to attend our Spiritual University and spend some time soul searching. Join our community of dedicated yoga practicioners. Yoga Vie is a Registered Yoga School (RYS); completion of this training meets eligibility requirements to register with Yoga Alliance as a 200 Hour Registered Yoga Teacher (RYT). Students are required to complete a minimum of 180 contact (in class) hours and 20 non-contact hours. 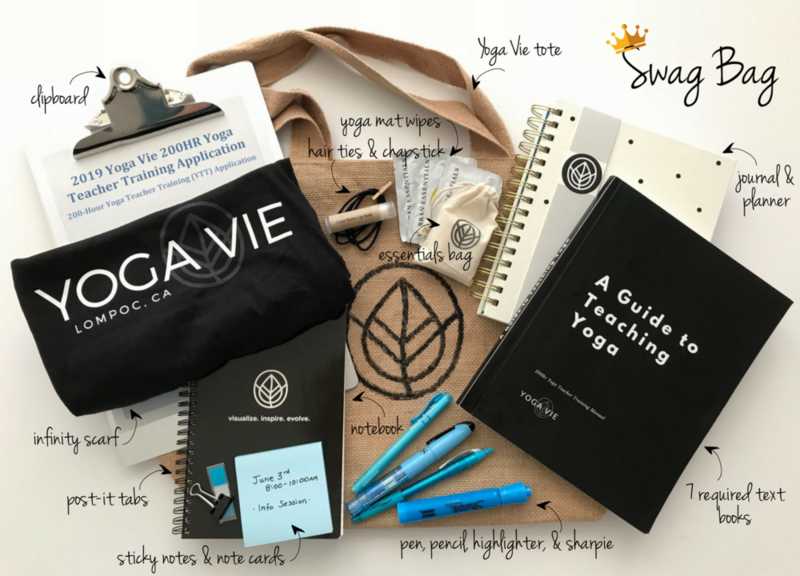 This training is a great way for current teachers to continue learning their craft or students to enjoy time away, immersed in the study of yoga. *ALL Tuition is due February 1, 2019. Payments may be made up until the due date. If tuition is paid after the the deadline a $300 late fee will be assessed. Make up sessions are not included. Please attend an info session or contact us for full details. Payment plans are available for the full training. *Each swag bag will be customized and may have slight variations (with the exception of text books). Swag bags are for first time YTT students. ** Restrictions apply. Ask for details. Thank you for submitting a request for application! We will get back to you with 72 hours to arrange payment. Virginia's yoga teaching style is heavily rooted in alignment-based asana and she encourages the use of props when necessary. Providing her students with a safe space to slow down and breathe deeply. Her approach is to teach individual bodies as they are in the moment, in their perfect nature; rather than the collective, forcing each student to look the same. She sees each body as something unique and strives to provide a positive experience, where each student is able to realize their highest self. She is an Advanced SmartFLOW graduate and continues to study with her teacher, Annie Carpenter. She has also studied with yoga teachers Richard Rosen, Leslie Kaminoff, Tiffany Russo, Trudy Goodman, Dr. John Casey, Cain Carroll, Mary Kay West, and Desi Barlett. Luana literally stumbled into yoga in 2008, when she stepped on an acorn and banged up her ankle, knee, and shoulder. An inner voice whispered “yoga” and as soon as her injuries healed, she began to practice. Within the first six months she lost 60 pounds and found a new lease on life. As the body opened and strengthened through asana practice, she uncovered a deep yearning for connection with the One. She began to study Sanskrit in 2009, which led her into yoga philosophy and a regular meditation practice. She has logged over 2500 hours of yoga teaching experience, and also teaches Sanskrit with the American Sanskrit Institute. She continues to study the great works of yoga -- the Yoga Sutras, the Bhagavad Gita, and the Upanishads, as well as the subtler aspects of pranayama. In 2016 she took initiation into the lineage of Sri Swami Satchidananda. Luana’s upbeat personality, calming presence, and kindness will encourage you to work deeply with awareness to find comfort and steadiness in your practice so that you may discover Peace -- your very essence. Luana will join us as a guest instructor to teach pranayama, meditation, chanting and an introduction to Sanskrit.